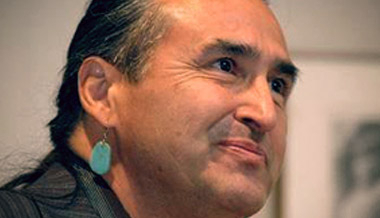 Richard Twiss (b. June 11, 1954 – d. February 9, 2013) was a Native American educator, author and theologian. He was a member of the Sicangu Lakota Oyate from the Rosebud Lakota Sioux Reservation in South Dakota. He was the Co-Founder and President of Wiconi International (Wee-choe'-nee is Lakota for "life") . In 1972, Twiss was a participant in the forced occupation of the Bureau of Indian Affairs Building in Washington, D.C., with the radical political group, the American Indian Movement or "AIM." Twiss later became a Christian minister, author, and public speaker. His vision was, "Serve as a bridge builder and consultant, nationally and internationally, to develop understanding, respect and mutual appreciation for one another, especially among Native American/First Nations people." Twiss, received an earned doctorate from Asbury Theology Seminary in inter-cultural studies (cultural anthropology, primal and folk religions and the history of Christian mission. He was a widely traveled and popular speaker for numerous government, educational and religious organizations as well as lecturer in dozens of colleges, universities, and seminaries. As a minster and theologian he was well known for his use of ironic humor and work in post colonial theology (see "Rescuing Theology from the Cowboys"). He consulted with denominational leaders, government organization and educational institutions, and local churches to raise awareness for Native American people and diversity awareness. Richard addressed a broad range of topics including missions history in relationship to Native American people and how it shaped U.S. history and federal policy; post modern thought and culture with a special emphasis on the influence of worldview in shaping theology, political ideologies, leadership, global mission, spiritual formation and social justice. As a Native American Richard brought a fresh and unique worldview perspective about what it means to "be human and follow Jesus," and to help his listeners learn to value and appreciate those who are different from oneself. As a respected Christian theologian he brought an understanding of the communal relational dynamics of the triune God. As a minster he brought understanding into evangelical Christianity of contextual forms of worship. He and his wife Katherine (married 1976), had four grown sons, and they resided in Vancouver, Washington since 1981. Richard's father, Franklin "Buster" Twiss was an enrolled member of the Oglala Lakota in Pine Ridge, South Dakota. He was a SFC Army veteran, was born on May 7, 1927. He died on August 17, 1999 in Hot Springs and was buried on August 23, 1999 at Black Hills National Cemetery. His mother, Winona LaPointe is from the Brule Lakota from the Rosebud Sioux Reservation in South Dakota. She was born Winona M. Larvie from Norris, South Dakota on the Rosebud Reservation. She attended the St. Francis Indian Mission School as a young girl through high school graduation. Twiss was a Board Member of the Christian Community Development Association, founded by John M. Perkins in 1989. He suffered a major heart attack on February 6, 2013 in Washington, District of Columbia. His death occurred three days later. His memorial service was held at Vancouver, Washington's Living Hope Church. He is survived by his wife and sons. Are we so consumed with "mission" that we miss out on God's pleasures? Richard Twiss reflects.